(Nanowerk News) Making thin films out of semiconducting materials is analogous to how ice grows on a windowpane: When the conditions are just right, the semiconductor grows in flat crystals that slowly fuse together, eventually forming a continuous film. This process of film deposition is common for traditional semiconductors like silicon or gallium arsenide – the basis of modern electronics – but Cornell scientists are pushing the limits for how thin they can go. They have demonstrated a way to create a new kind of semiconductor thin film that retains its electrical properties even when it is just atoms thick. Three atom-thick layers of molybdenum disulfide were cooked up in the lab of Jiwoong Park, associate professor of chemistry and chemical biology and member of the Kavli Institute at Cornell for Nanoscale Science. The films were designed and grown by postdoctoral associate Kibum Kang and graduate student Saien Xie. Their work is published online in Nature, April 30 ("High-mobility three-atom-thick semiconducting films with wafer scale homogeneity"). “The electrical performance of our materials was comparable to that of reported results from single crystals of molybdenum disulfide, but instead of a tiny crystal, here we have a 4-inch wafer,” Park said. Molybdenum disulfide, which is garnering worldwide interest for its excellent electrical properties, has previously been grown only in disjointed, “archipelago”-like single crystal formations, Park said. But making smooth, flat, ultrathin sheets, like paper, is the ultimate goal, and the bridge to actual devices. The researchers pulled off the feat by tuning the growth conditions of their films using a technique called metal organic chemical vapor deposition (MOCVD). Already used widely in industry, but with different materials, it starts with a powdery precursor, forms a gas and sprinkles single atoms onto a substrate, one layer at a time. Park’s group systematically optimized the technique to make the films, tweaking conditions and temperatures not unlike experimenting in the kitchen. They found that their crystals grew perfectly stitched together, but only with a little bit of hydrogen and in completely dry conditions, for example. In addition to advanced optical imaging techniques, researchers led by co-author David Muller, professor of applied and engineering physics and director of Cornell’s Kavli Institute, contributed advanced transmission electron microscopy to test and characterize the quality of the films as they went along. 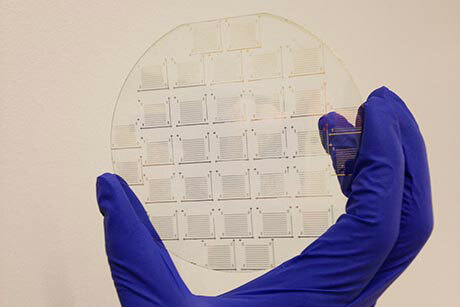 The team also demonstrated their films’ efficacy when stacked layer by layer alternating with silicon dioxide and employing standard photolithography. This effectively proved that these three-atom-thick semiconducting films can be made into multi-level electronic devices of unsurpassed thinness. The MOCVD method for thin film generation is seemingly generic. The researchers showed the ability to simply change the precursor to make other films; for example, they also grew a tungsten disulfide film with different electrical properties and color. They envision perfecting the process to make atomically thin films of all varieties, like a packet of colored paper, from which new, exciting electronic and optoelectronic devices can be derived. “These were only the first two materials, but we want to make a whole palette of materials,” Park said.